PORTLAND, Ore. -- It is often said that playoff success is about peaking at the right time. Veteran teams are said to flip the switch at the start of spring, while upstarts who materialize in March are finally jelling when the games matter more. So long as you've avoided abject disaster through the first four months of the season, conventional wisdom holds, what matters is that you go into the postseason playing your best ball. Everyone starts 0-0 in the playoffs and all that. Sunday night, the Portland Trail Blazers hosted the Memphis Grizzlies in a contest between two teams trying to lay claim to whatever timely energy sustains the teams of destiny. The Grizzlies, improbably, find themselves in the pack of Western teams vying for one of the last three playoff seeds after recovering from Marc Gasol's midseason ACL sprain. Memphis came into Sunday 11-4 in the month of March behind its patented grappling defense, and looked to be on a trajectory that the Blazers -- who struggled through a month that saw their playoff seed fall seemingly by the day -- might have envied. What's more, the teams' previous two meetings had been convincing Memphis victories, so from a certain angle this game looked like a matchup between two teams heading in two different directions as the playoffs bear down. 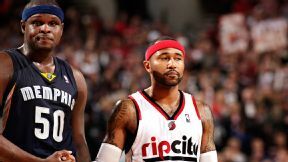 Cameron Browne/NBAE/Getty Images In the West chase, Zach Randolph and the Griz were outdone by Mo Williams and the Blazers. But at the end of the night, it was the Blazers talking momentum and the Grizzlies leaving the Northwest on the outside of the playoff hunt. In a reversal of their previous matchups, Portland controlled this game from the outset and looked very much like its earlier-season self, pouring in perimeter jumpers and getting balanced contributions offensively while relying on sound -- if less than smothering -- defense to come away with the win. It was the Blazers' third consecutive victory, after they salvaged a nearly catastrophic five-game road trip with victories in Atlanta and Chicago. That trip began with three straight losses and bottomed out in Orlando, where Portland, missing LaMarcus Aldridge to a back contusion, mailed in a dispiriting performance against the Magic. "After the Orlando game," said Blazers coach Terry Stotts, "I think there was more resolve." With the team in danger of tumbling down the conference standings, Stotts said, the Blazers realized the urgency of the situation. "We got four teams that are right on our tail," said Stotts. "That's why after the Orlando game was the time to realize where we are in the standings, where everybody else is, and the importance of every game." Getting Aldridge back certainly didn't hurt, either. Portland's fulcrum missed seven total games with his back injury, just a few weeks after a strained groin held him out following the All-Star break. As their franchise player healed, the Blazers found themselves unable to hold their ground. They dropped heartbreakers, were blown out by the Bobcats and needed overtime to scrape past the Bucks. His return in Atlanta sparked their current streak, and he carried the team past Memphis with 28 points against the stout Grizzlies front line. Meanwhile, the Grizzlies lost an opportunity to gain ground on a night when Phoenix and Golden State each lost. Memphis remains tied in the loss column with the Suns and Mavericks, but it's heading to Denver for the second night of a back-to-back in thin air. Though they mounted something of a comeback in the game's final minutes, the Grizzlies were mostly listless in Portland, allowing the Blazers to shoot over 50 percent from the floor. They'll need to play more to character if they want to emerge from the three-team race for the conference's final two playoff spots. After a March that saw them hit the road for two five-game swings, the Blazers can look forward to a relatively easy closing schedule as many of their competitors nurse ailments of their own. The Warriors, who still visit the Moda Center one more time this season, remain the most likely candidates to catch Portland for the fifth seed, but they're missing Andrew Bogut and, for a shorter time, David Lee. The Rockets, who the Blazers will meet in the first round if they can stay on course, just lost starting point guard Patrick Beverley to a torn meniscus. It's been a long few months since the Blazers were the darlings of the league, and they've opened themselves up to a host of questions, but all of a sudden they have a tenuous hold on health and something like momentum as the rest of the conference's middle class takes on water. If they can steel their resolve just seven games longer, the Trail Blazers may emerge, after months of looking like they peaked too early, as a team heading into the postseason at full strength. MVP: If the game had ended at the half, it'd be J.R. Smith, but he missed all of his six shots after intermission so it goes to Stephen Curry, who scored 32 points and hit 6-for-12 from downtown. Without David Lee and Andrew Bogut and with Klay Thompson having an awful game, Curry carried the Warriors' offense. Defining moment: Though the Knicks started the fourth shooting 2-for-15, they were still clinging to an 87-74 lead with five seconds to go when a double-teamed Curry tried to dish it to Draymond Green, but Shannon Brown snagged the ball and sank two free throws to seal the win. That was ... surreal. The Warriors eschewed the pick-and-roll versus a team that couldn't defend it to save their lives. Carmelo Anthony's shot selection was beyond atrocious. Mike Woodson's substitution patterns were bizarre. And the Knicks are a game out of the eight spot in the East. MVP: Chris Kaman is neglected by Mike D'Antoni no more. The Lakers' current starting center scored 28 points, grabbed 17 rebounds and dished out six assists to lead Los Angeles, which scored 56 points in the paint on Sunday. Defining moment: Phoenix trailed by just 13 points early in the fourth quarter, but Lakers point guard Kendall Marshall, the Suns' 2012 lottery pick, followed a Ryan Kelly layup with an and-one as Suns guard Ish Smith, who now mans the back-up point guard spot, fouled him. X factor: A fast pace helped the Lakers on both ends. The Suns, known as a strong fast-breaking team, rushed through their offense and launched 36 threes, making just eight. Transition opportunities for Los Angeles also led to several defensive breakdowns by Phoenix. MVP: DeMar DeRozan's parade to the free throw line (15-for-16) fueled his 28-point performance (on 14 shots!) and allowed him to be economical with his offense. It was fitting that he iced the game with two free throws. Defining moment: Trailing 96-93 with 8.9 seconds left, the Magic had a chance to tie the game but Maurice Harkless -- the inbounder -- committed a five-second violation. Credit the Raptors for doing a great job of defending the play. That was ... fun to watch: Nikola Vucevic (22 points, 10 rebounds) and Jonas Valanciunas (20 points, 9 rebounds) played themselves to a draw in an exciting matchup between two centers in the NBA who are young, talented, and still getting better. MVP: Paul Pierce set the tone early for Brooklyn, playing aggressive on the offensive end and scoring 16 points in the first quarter. He missed a lot of action due to foul trouble, but made some big plays again down the stretch for the Nets to help them pull out the win. 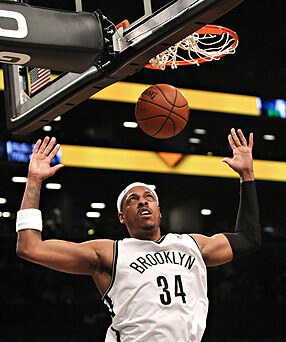 X factor: The Nets' bench gave Brooklyn a big boost in this one. Andray Blatche had 14 points and Alan Anderson added 13, including a couple 3s down the stretch. The Nets' bench as a whole outscored the Timberwolves' bench 41- 23 and gave them a distinct upper hand in the contest. Defining moment: Pierce came out on fire, scoring 16 points in the first quarter, and because of his early outburst, the Timberwolves were constantly playing catch-up. Pierce was a perfect 6-for-6 in that first quarter, including 4-for-4 from beyond the arc, and he set the tone for the Nets' victory. MVP: D.J. Augustin couldn't miss off the bench, dropping 33 points on 10-for-14 shooting, 3-for-4 from behind the arc. Augustin's 3-pointer with 1:19 remaining gave the Bulls a lead they would never relinquish. X factor: Just four Bulls attempted 3-pointers (Augustin, Jimmy Butler, Mike Dunleavy and Kirk Hinrich) but they were an efficient 8-for-16 from downtown. Boston, meanwhile, was 10-for-29 -- just 34.5 percent. That was ... Rondo-like: Joakim Noah posted 13 points, 8 rebounds and 13 assists -- the type of line fans commonly associate with Rajon Rondo. On one particularly Rondo-esque play, Noah grabbed a rebound, led a fast break and threaded a tough pass between defenders for a layup by Augustin. MVP: LaMarcus Aldridge scored early and often. He finished with a game-high 28 points. Honorable mention: Mo Williams added 17 points on 7-of-9 shooting off the bench. Defining moment: Midway through the second quarter the Blazers went on a 16-4 run. Although a late Memphis rally cut Portland's lead to single digits, the Blazers maintained a comfortable cushion throughout. That was ... Portland's first win over a Western Conference playoff contender since Jan. 18 (at Dallas): It was also a bit of a return to early-season form as the Blazers simply made buckets. They shot 52 percent from the floor. MVP: Dion Waiters. Waiters scored nine of his 19 points in the fourth quarter. Early in the period, Waiters got hot from outside -- to the point where Indiana switched off Lance Stephenson and guarded him with Paul George instead. LVP: David West. Tristan Thompson lined up opposite West and collected 16 rebounds to West's four. West also got a flagrant foul 1 for whacking Matthew Delladova with a forceful elbow in an attempt to clear space for a layup attempt. X factor: Delladova provided an energy boost off the bench for which the Pacers had no counter. His six assists were more than just passes -- they were actual helpers that created open shots for his teammates. His plus/minus rating of plus-24 was the game's best by a large margin. MVP: Kevin Durant. KD had 31 points, four rebounds and nine assists in just 29 minutes. Durant hit four 3s, all nine of his free throws, and sat out the entire fourth quarter as his team won by 20. X factor: The Thunder hit 11-of-18 from downtown. Every time the Jazz threatened to cut the Thunder lead, KD or Caron Butler, who went 5-for-5 from deep, hit a triple that swung the momentum back to OKC. That was ... predictable: The Thunder raced out to leads of 11-0, 26-7 and 39-14 in the first half. Though the Jazz challenged at various points in the game, this one was never in doubt. D.J. Augustin, Bulls: The Pacers could have probably used their former backup point guard's career-high 33 points on Sunday. Augustin had 15 points in the fourth to help the Bulls to a 107-102 win over Boston. Offensively-challenged Indy, meanwhile, could only hang 76 on the Cavs. Indiana Pacers: After a 90-76 loss to the Kyrie Irving-less Cavs, the Pacers now lead Miami by one game for the East's top record and home-court advantage throughout the East playoffs. Since beating the Heat at home last week, Indiana has lost to Washington and Cleveland. "We're losing games at an alarming rate to teams that are inferior to us." -- David West, after Indiana took consecutive losses to Washington and Cleveland. Noah K. Murray/USA TODAY Sports Paul Pierce, who scored 17 points in the first quarter Friday, had 16 points on 6-of-6 shooting by the time he checked out after 10 minutes to open a win over the Wolves. He is 8-for-8 on 3-pointers in 17 minutes over the past two first quarters. Joakim Noah contributed 13 assists to the Bulls' 107-102 victory at Boston. That was the highest assist total ever recorded by a visiting center against the Celtics. The previous mark was 11, by Wilt Chamberlain of the 76ers in January 1968. It was Noah's sixth game with 10 or more assists this season, the most in one season by a center since Vlade Divac recorded nine double-digit assist games in 2003-04. All of Noah's 10-assist games have come since February 6; he has averaged 7.3 assists per game during that time.